Everyone has a Cordova story, whether they like it or not. Maybe your next-door neighbor found one of his movies in an old box in her attic and never entered a dark room alone again. Or your boyfriend bragged he'd discovered a contraband copy of At Night All Birds Are Black on the Internet and after watching refused to speak of it, as if it were a horrific ordeal he'd barely survived. "On a damp October night, beautiful young Ashley Cordova is found dead in an abandoned warehouse in lower Manhattan. Though her death is ruled a suicide, veteran investigative journalist Scott McGrath suspects otherwise. As he probes the strange circumstances surrounding Ashley’s life and death, McGrath comes face-to-face with the legacy of her father: the legendary, reclusive cult-horror-film director Stanislas Cordova—a man who hasn’t been seen in public for more than thirty years. For McGrath, another death connected to this seemingly cursed family dynasty seems more than just a coincidence. Though much has been written about Cordova’s dark and unsettling films, very little is known about the man himself. Driven by revenge, curiosity, and a need for the truth, McGrath, with the aid of two strangers, is drawn deeper and deeper into Cordova’s eerie, hypnotic world. The last time he got close to exposing the director, McGrath lost his marriage and his career. This time he might lose even more. 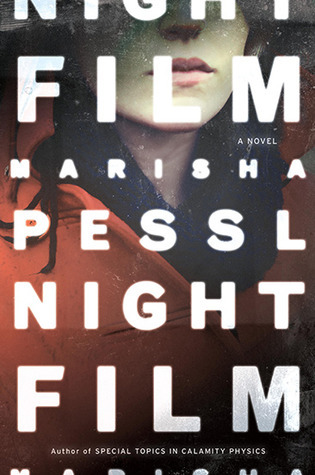 Night Film, the gorgeously written, spellbinding new novel by the dazzlingly inventive Marisha Pessl, will hold you in suspense until you turn the final page." Night Film was an almost hypnotic read, and right from the first section, it drew me into the dark and strange story of the Cordovas. I haven't read Marisha Pessl's first book Special Topics in Calamity Physics, but I really enjoyed her second literary mystery novel. It's quite a good genre with a wide range of types. The Cuckoo's Calling, for example, was good in its own way, and Night Film was very different but amazing too. And pretty scary. I love how the book uses mixed media; most is written in a traditional first person narrative from McGrath's point of view, but in between those sections are emails, texts, articles, phone call records, and more, as seen on the main character's web browser. I really liked that aspect, as it made the book seem more realistic and offered a break between the narrative. I especially enjoyed the fake newspaper articles about Ashley Cordova and her father; they were very illuminating, even though there was much more to them than what any mainstream article would say. It still added a great deal and made the book much more interesting. I was worried that this aspect of Night Film wouldn't work, but it did. I enjoyed the secondary characters, particularly Nora, who had a great name for a mystery novel, although it's not a very common one. All of the characters, I think, could have been more described, but it was the mysterious, disturbed Cordova I was most interested in. Some parts of his so-called philosophy and what the fake website were saying actually seemed appealing, but other parts were just disgusting. Cordova's main idea is that fear is the beginning of freedom. I can tell you that I certainly wouldn't want to watch any of Cordova's films, which the first paragraph mentions terrifying people so badly that they're scared of the dark forever after or refuse to speak of it. However, the film of his that his daughter was in sounded really interesting. Here's the description from page 165 in the ARC and page 143 in the final copy of Night Film: "The wealthy, corrupt Stevens family - a gorgeous clan of dissipated Caligulas living in an unnamed European country - is calculatingly butchered, one by one, confounding the police. Though the inspector assigned to the case eventually arrests a tramp who did landscaping work for the family, the movie's final hairpin twist reveals the killer is actually the family's youngest child, the mute, watchful eight-year-old Gaetana - played of course, by Ashley. By the time the inspector pieces this grisly truth together, it's too late. The little girl has vanished. The last scene shows her strolling along the side of the road, where she's picked up by a traveling family in a station wagon. In true Cordova style, it's left ambiguous if this family is destined to meet the same horrific fate as her own, or if she simply made herself an orphan so she could be raised by a happier family." Doesn't that just sound great, if horribly gruesome? It also provides Scott and his new assistant Nora with something to go on about who Ashley was, although of course that was when she was a little girl acting. There are so many threads they must investigate, but who knows which are fact and which are fiction? The Cordova family and their history is so enigmatic. Night Film is an engrossing and disturbing novel. Towards the latter half of it, things got a little bit bogged down, but I was always absorbed, and I was certainly glad that I got an ARC from Random House. Night Film came out August 20th.